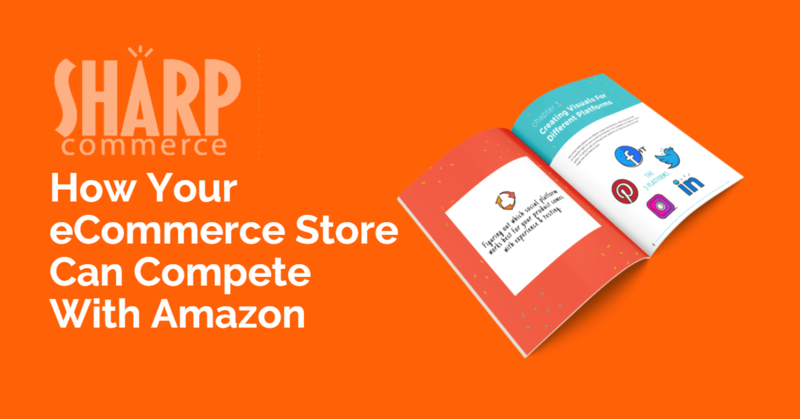 Here are some tangible ways you can increase your eCommerce Store sales and actually take a chunk of your market share back from Amazon! Purchasing from Amazon is a plain vanilla experience. Take advantage of this by personalizing the user experience(UX) on your local webstore to excite your customers and set your webstore apart. Use a voice that's true and 'yours' throughout the entire eCommerce customer journey. Make sure to add little tips and tidbits to product descriptions and category header text. This gives a human feel to the content and buying experience. Many customers like the idea of buying from independent retailers instead of Amazon but you've got to let them know you're not a huge corporation. Create a Staff Picks section with an overview of contributors and bios. Use verbiage throughout your descriptions and articles that match your demographic and company culture. Interlink your blog articles with appropriate product pages for added SEO punch and authority on what you sell. Amazon presents all of its listings basically the same way. Take advantage of this weakness by using a custom template to display your products optimally. Some high-end eCommerce carts (Magento) will allow you to use custom templates that can be assigned to each product type to optimize UX. If you have a more basic eCommerce solution you can opt for just increasing the overall information on the product page so customers have more than enough information to make a purchasing decision. Some common examples are detailed info on compatibility, specs, application and proper presentation of these elements. Having all of the information on a product that is custom is important to keep their attention and build authority. Using a 'voice' that shows you know your products can be the deciding factor between customers buying from you or...bouncing back to Amazon. Amazon is a solid source for items if you know what you want. But what if you have questions about which product fits your needs? Do your prospective customers know you have the answers? Take advantage of this Amazon limitation with in-depth articles and in-depth reviews with product applications of your most popular and newly released products on your blog. Link them to your product pages or better yet embed them to improve the customer experience. Make sure your staff is trained and up to date on new and popular products so you'll have the answers when a customer calls in or emails. When fulfilling orders, include some marketing materials to increase the customer engagement and lifetime value. Adding an attractive one time use coupon, flyer on upcoming promotions, showcase of popular items, paper catalog, if you have one, can drive that next sale. Adding a personal touch like a handwritten note can really stand out and solidify your customer relationships. If you do happen to sell on Amazon as well as your own website, don't list your really special, hard to quantify products on Amazon. These are products that customers are seeking you out for and Amazon doesn't have access to. This may not make sense in all scenarios but it's something to strategically consider depending on supply and demand. Carefully deciding which products to keep exclusive to your local webstore can be an advantage, especially if your site has enough rank and traffic to fill the general demand in the marketplace. The main reason many shoppers choose Amazon is fast shipping. You won't beat Amazon there. However; with modern shipping solutions and a streamlined warehouse you can send orders nearly as fast in many cases but how will your customers know this? Many online retailers selling on their own webstore as well as Amazon, deal with Amazon questions and shipments first. Amazon scares online retailer partners with threats of account suspension. This tactic results in Amazon questions and shipments taking priority over local webstore orders. Make sure your staff knows to treat all inquiries and shipments with the same intensity as Amazon. And yes, you're likely going to need to up your game with your customer service to make that work. This is all solid, good stuff that will increase your current customer retention and sales regardless of competing with Amazon. Also, implement a solid CRM system like Kayako or Zendesk with Live Chat feature to respond to customers quickly and improve the customer experience. This seems simple but presenting your phone number loud and proud and actually answering the phone greatly increases customer confidence. There's a certain segment of your consumer base that wants to either place an order on the phone or wants to talk to someone about the order. It's simple, it works and Amazon can't really do it. At best you'll get a foreign voice on the other end of the phone that knows little to nothing about the product being inquired about.